The Newfoundland is a giant dog that with a hard-working spirit and a gentle disposition. The breed is intelligent, noble and very loyal. 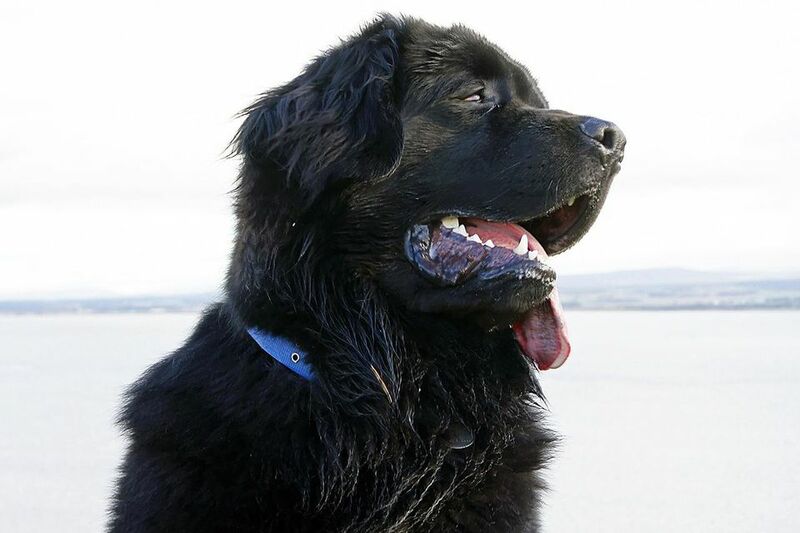 Often called Newfs or Newfies, Newfoundlands make excellent working dogs. However, they are also calm and affectionate companions. The Newfoundland dog breed originates from the Canadian province of Newfoundland, where it has a rich history as an ideal working dog. These superb water dogs have assisted fisherman, rescued potential drowning victims, and hauled carts. It is believed that the ancestors of Newfies were brought to Newfoundland by European fisherman. Though their exact lineage is widely debated, the most popular theory suggests that the Newfie evolved from Great Pyrenees dogs and black retrievers. The English botanist Sir Joseph Banks adopted several in the 18th century. A Newfoundland named Seaman was part of the Lewis and Clark Expedition exploring the newly-acquired territories in the early 1800s with his owner, Meriwether Lewis. Other famous owners include Emily Dickinson, Ulysses S. Grant, Lyndon B. Johnson, Robert F. Kennedy, composer Richard Wagner, and John James Audubon. By the 19th century, Newfies had become popular in England. Soon after, the breed arrived in the US and was recognized by the American Kennel Club (AKC) in 1879. Like many large breeds, their numbers suffered in the U.K. and Europe after the world wars, but began a resurgence in the 1950s. There are many tales of Newfoundlands used as water rescue dogs, as well as impromptu rescues done by Newfoundlands when the dog as noted a person in distress. The Newfie has a thick, medium-long coat that serves as insulation from cold waters. This coat has a relatively high shedding rate (especially in spring and fall) that requires regular grooming, specifically hair-brushing two to three times per week. You will probably need professional grooming as well to keep the dog looking good. These dogs are prone to tracking around debris and mud on their long coats, so be prepared to clean up after your dog returns from playing outside. The Newfie may naturally wear down its nails due to its large size, but be sure to check the toes and trim the nails as needed. This breed can be a drooler, so many owners prefer to keep a "slobber cloth" handy. When a Newfie shakes its head, there a good change the spit will go flying. Newfies have a strong drive to work and protect. They need daily exercise to keep them fit and happy. They love to swim and can be a great companion in the right lake, stream, or pool. In addition, Newfies will benefit from some type of "job," such as guarding the home or obedience competition. In general, these are usually very calm, loyal and loving companions. Newfies are intelligent dogs that respond very well to training. Proper socialization and training are both very important for all dogs. However, the giant size of the Newfie make training and socialization essential so you can maintain control of your dog. You'll need to train this dog well for walking on a leash due to its size. The Newfoundland is an affectionate and gentle dog breed that makes a delightful companion. These versatile dogs have a natural instinct to protect and assist people, making them wonderful service dogs and family pets. Typically, this breed gets along very well with children. However, a Newfie may not realize its size. Use caution around very small children. You don't necessarily need a huge home and large yard to have a Newfie. However, a very tiny home can make things difficult. Make sure there is enough room in your home for a dog that weighs over 100 pounds to get around comfortably. Also be sure you have the space for large dog beds and lots of dog supplies. While Newfoundlands do well in cold weather, they will need a cool place to hang out in hot weather so they don't overheat. A Newfoundland should be fed twice a day with up to 2.5 cups of dry dog food per meal. The appropriate amount will depend on your dog's individual size, activity level, age, and any health conditions. Provide access to fresh, clean water. This breed may experience bloating and stomach torsion, which is a medical emergency. It's best not to provide only one meal as the dog may gulp it down and increase the risk of this problem. Many also recommend that you don't exercise your dog for an hour your pet has eaten. Be sure to monitor your pet's weight to prevent obesity, which can shorten a dog's lifespan and contribute to other health conditions. Discuss your dog's nutritional needs with your veterinarian as they will change throughout your pet's life. Your vet should be able to recommend the right food, amount, and feeding schedule. If you would love to get a Newfoundland of your own, make sure to do research first. Ask veterinarians, Newfie owners, reputable breeders, and Newfie rescue groups for more information about the breed. Explore many different dog breed profiles to find the right companion to bring home.